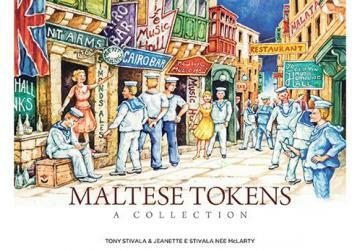 Save one former publication, issued in 1999 by Bob Lyall, in which Tony Stivala assisted the author by placing his own collection for study, no other publication has ever been published on the subject of Maltese tokens. However, one can find further information on the use and the exchange of the famous landa and other tokens in Malta in learned journals and publications, such as those by John Schofield and Emily Morrissey, Strait Street – Malta’s Red-Light District Revealed (2013), and George Cini’s Strada Stretta ‒ it-Triq li Darba Xegħlet Malta (2010), especially the latter. Tokens were first used in Malta during the time of the Order of St John (1530-1798). Several crude brass or copper pieces, bearing no denomination and dating to Grand Master Philippe Villiers L’Isle Adam’s tenure (1530-1534), can be found. These, however, feature the Grand Master’s coat of arms very crudely. Past numismaticians and historians (such as G.H. Furse, H. Furse, Canon H. Calleja Schembri and Restelli & Sammut) believed that such pieces were coins or weights, an opinion I do not share. Malta’s economy at the time did not cater for small change, and the official picciolo, the smallest coin denomination used by the Order in Malta, came to be during the rule of Grand Master Claude de la Sengle (1553-1557). At times, slaves were paid by paper tokens that could be redeemed for bread from the Order’s bakery (from a verbal communication by Liam Gauci, through archival sources). Four well-minted tokens are considered to belong to the time of the two Cottoner brothers’ rule (1660-1680), each featuring three month names in Italian and symbols, one of St Paul and one of a fire. In Italian numismatic circles, these are considered to be Italian tokens, not Maltese. A silver, round Grand Master Emmanuel Pinto (1741-1773) flan, well minted and equal to the Order’s other coinage, is erroneously considered to be a token, being of somewhat equal weight and size of past (Grand Master Antonio Manoel de Vilhena) and future (Grand Master Emmanuel de Rohan) six-tari coinage, taking inflation into account. This publication is about tokens used in Malta during the British period, mainly from the late Victorian period to the 1960s. The Stivalas have managed to find quite a good number of tokens since Lyall’s 1999 publication, in which 95 different establishments had been identified. This publication identifies no fewer than 84 new establishments, most of which are new or different to those already identified by Lyall. The use of tokens in Malta, instead of the official legal tender coinage issued by the government, forms part of Exonumia, a term that incorporates all numismatic items made of various materials, sizes and shapes other than official coins and paper money, used for a variety of reasons. Some are purely ‘trade tokens’, issued by companies as money substitutes featuring a monetary value, such as those issued by the Milk Marketing Department. Others are ‘checks’, having a varie­ty of uses, including advertising, issued by various establishments, such as those by S. Genovese. Others still are ‘credit cards/medals/coins’ issued by companies to clients who held accounts with them, whatever the business was, characterised by a small hole with which to hold in key chains, such as those issued by Joseph Arrigo. These are just three types of tokens, and the list, variants, uses and sub-uses is endless. These Malta, tokens, in their various forms and intended use, tell the economic and social history of Malta, albeit, at times, verging on the shady side. Nevertheless, it is a Malta story which these tokens help to commemorate and immortalise. Tony and Jeanette Stivala de­serve our compliments for publishing such a rare collection and research for everyone’s enjoyment and perusal, a most welcome addition to Melitensia collections and publications.